This time, in addition to the renowned Dallas Wind Symphony and its music director Jerry Junkin, we have the services of Mary Preston, resident organist of the mighty Fisk concert instrument in the Meyerson Symphony Center. No one knows better than she the capabilities of the Fisk, and Mary Preston can make it sing and shout. 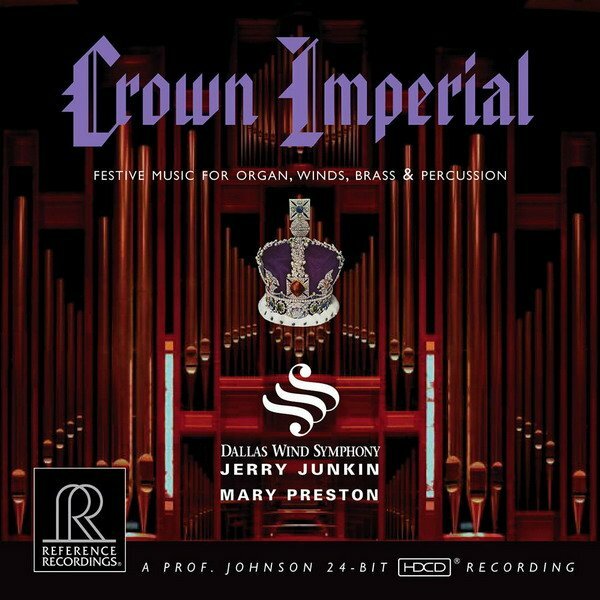 In addition to the royal coronation anthem CROWN IMPERIAL by William Walton, there are substantial pieces that are seldom heard in such full instrumentation. Richard Strauss contributes a stately FESTIVAL INTRADA; there’s a CANZON originally composed “in stereo” by Giovanni Gabrieli; a ceremonial brass FANFARE by Henri Tomasi; an unusual arrangement by Percy Grainger of the famous COUNTY DERRY AIR; ELSA’S PROCESSION TO THE CATHEDRAL from Lohengrin by Richard Wagner, who knew how to bring an audience to its feet; KAMMERMUSIK #7, a full concerto for organ and winds by Paul Hindemith; and NIAGARA FALLS, a rousing, wild ride by popular American composer Michael Daugherty.